Let us know if there are changes to your phone number or mailing/email address. We would also like updates on your insurance situation and bank account information. Providing us with the most up-to-date information will help avoid any delays to assistance. Give us a call at 800-621-3362 to update your contact information or if you have questions. Survivors who are deaf, hard of hearing or have speech disabilities should call 800-462-7585 (TTY); those who use 711/VRS may call 800-621-3362. You can also update your information online at disasterassistance.gov. We are working with our local, state, non-profit, and faith-based partners in both Calaveras and Lake Counties to get help to those who still need it. If you were impacted by the Butte Fire, you can find help from Calaveras Recovers, a group that includes the American Red Cross and Habitat for Humanity, along with several other government and non-profit organizations. Visit their website, calaverasrecovers.net, to learn about meetings near you and to see a full list of member organizations. If you were impacted by the Valley Fire, Team Lake County is a volunteer-led, long-term recovery resource that can work with you and your family to find solutions for any unmet needs. For information on partner organizations and available assistance you visit either their Facebook page, facebook.com/teamlakecounty, or their website, teamlakecounty.org. Calaveras County: Crews are working to remove debris from properties participating in the state / county debris removal program. For those not participating in this program, detailed information on self-certification of debris removal is available on butte.calaveras.gov. Lake County: Debris removal is being sponsored through CalRecycle at no cost to you. Find out how to sign up for the program, as well as additional information on Valley Fire recovery at lakecountyrecovers.com. Crisis counseling services are available through the Calaveras and Lake County Mental Health Departments to help both adults and children cope with disaster-related stress. Disaster Legal Services are provided to survivors free-of-charge through the Young Lawyers Division of the American Bar Association. Services include assistance with insurance claims, advice on landlord/tenant disputes, home repair contracts and contractors, mortgage-foreclosure issues, assisting in consumer protection matters, and guidance on replacement of wills and other important legal documents. Disaster Legal Services can be reached at 800-657-0479 between 9 a.m. and 9 p.m., Monday through Friday. Keep in mind that legal advice is limited to cases that will not produce a fee. Remember that cash is the most efficient method of donating. Be safe and donate through a trusted organization. For more information, visit our page on volunteering and donating responsibly. Lake County has pulled together a page of resources for those interested in providing donations for Valley Fire recovery. You can also visit lovelakecounty.org for further information on donations and volunteering. If you’re interested in giving to survivors of the Butte Fire, Calaveras County has a list of resources on where to donate. Middletown, CA -- Homeowner Ron Steenkouigh of Middletown, California had mitigation on his mind when the roof was installed on his home. He knew the risks of wildfires and took action to give his home a chance to survive the heat. For more information on how you can prepare for wildfires, visit ready.gov/wildfires or usfa.fema.gov. California has put together resources for being storm ready at storms.ca.gov. Visit floodsmart.gov to learn your flood risk and for more information on flood insurance. 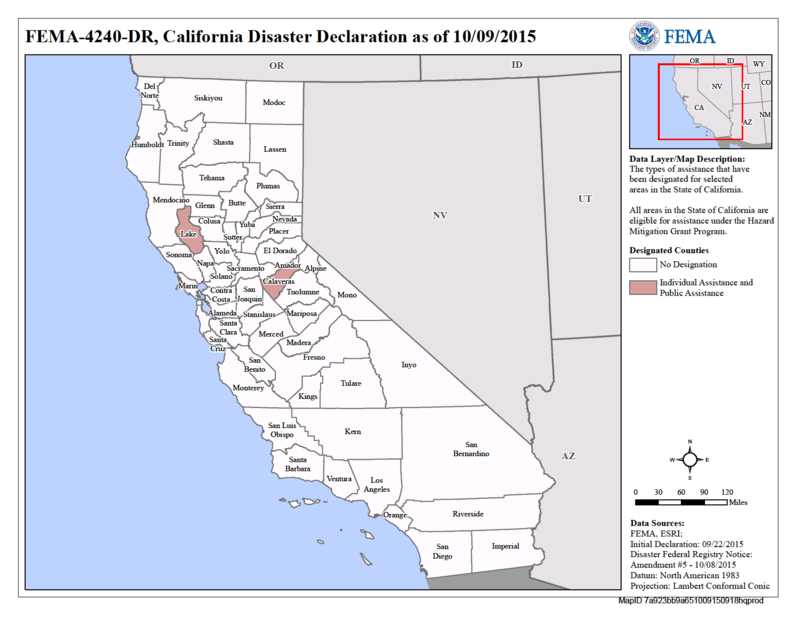 The United States Geological Survey has a page on preparing for El Nino in California at elnino.wr.usgs.gov.